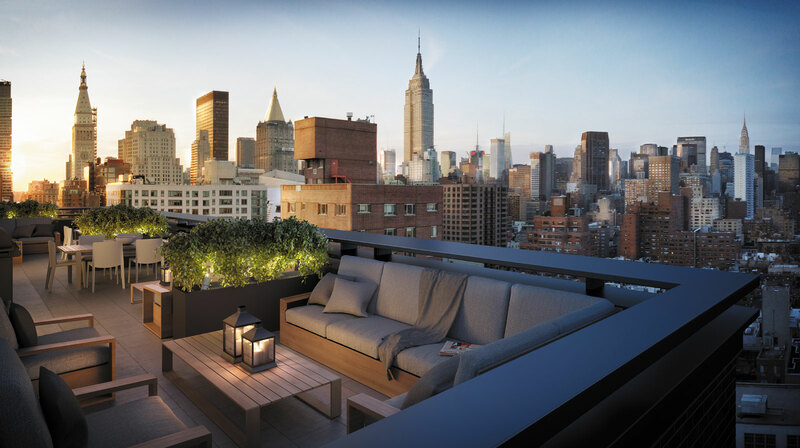 With just two units remaining at 234 East 23rd Street, The Naftali Group is releasing new renderings of the penthouse residence now on the market for $6.445 Million. The 4 bedroom, 3.5 bath home boasts 2,302 SF of indoor space, 1,345 SF of outdoor space, and beautiful panoramic views of the Manhattan skyline. According to Naftali Group, the brisk sales pace at the 57-unit luxury condominium is due to the growing popularity of Gramercy Park coupled with the building’s beautifully designed finishes and hotel-inspired amenities and lounge spaces. With interiors designed by Rottet Studio, a firm well-known for their hotel designs, 234 East 23rd Street marries classic Manhattan architecture with modern elements. The residences offer an open and airy living space with floor-to-ceiling casement windows that allow sunlight to spill onto the hardwood floors. The homes feature chef-caliber kitchens with open shelving and include state-of-the art Sub-Zero and Bertazzoni appliances. The luxurious bathrooms echo qualities of an urban spa. When residents step into 234 East 23rd Street, they enter a lobby styled after a boutique hotel. Amenities include a roof terrace with a barbecue and outdoor kitchen, and a garden terrace catering to residents seeking a more tranquil setting. There is also a state-of-the-art fitness center, lounge area with a pool table, individual private storage units and bicycle storage. The sales success at 234 East 23rd comes on the heels of significant milestones at other Naftali Group projects: The Seymour at 261 West 25th Street recently sold out and their latest condominium development at 210 West 77thStreet is now 65% sold after re-launching in April. For more information, please visit the website at 234e23.com or call the sales office, located at 346 Park Avenue South, 4th Floor, at 212-234-2330.